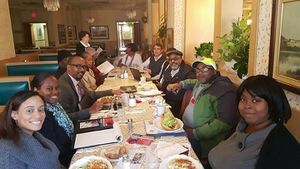 Friendly business owners in a meeting of the Haverford Avenue Business Association. Our Businesses: We offer a wide range of businesses from shopping and entertainment, to local eateries in our area. Our Members: Become a member of the Haverford Avenue Business Association. Our Association is continuing to grow with a wide range of businesses joining. Our Events: Check out and attend our events. We have our iconic National Night Out here in our community. We also have meetings to help build and make our community a better place. Our Mission: To promote, represent, and advocate for the businesses, services, and shops located on Haverford Avenue and within the Overbrook Park area. Food-truck controversy heats up in Overbrook Park, Philly Voice, May 25, 2018. This page was last edited on 26 July 2018, at 16:46.